When you need to dewater fast, keep the Porta-Matic™ portable dewatering pump nearby to pump everything on your job site from ditches to manholes. This portable dewatering pump delivers up to 43 gpm and a head pressure of 25′. 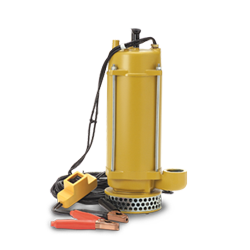 Powered by any 12-volt truck or auto battery, the Porta-Matic portable dewatering pump weighs just 33 lbs and provides whisper-quiet operation. The Porta-Matic portable dewatering pump.